Set photos reveal epic fight scenes in X-Men and Captain America 2! Wolverine had to lose an essential part of himself for his latest solo movie. Zack Snyder explains how he avoided making Superman a god in Man of Steel. Joss Whedon muses on the internal struggles of The Avengers 2. Check out the latest images from the sets of Captain America: The Winter Soldier and Godzilla. Spoilers now! 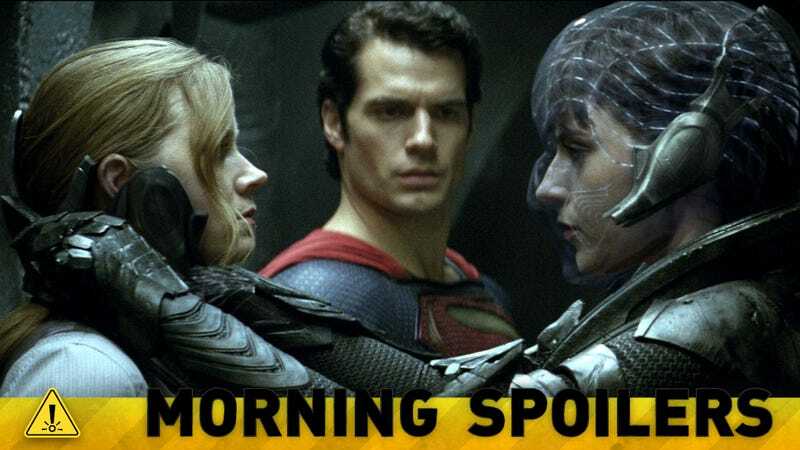 Here's the latest sneak peek clip, featuring Christopher Meloni as Colonel Nathan Hardy and Antje Traue as Faora. Here's a pair of interviews with stars Henry Cavill and Russell Crowe, courtesy of Hitfix. "I went into the movie trying to say, if we were Superman, how would we react in these situations? Because I always felt in the past Superman has kind of been this unrelatable character — we look at him like a god. And I felt like I understood the 'why' of Superman ... we understood his love of humanity and his morality and then we would 'get' the grown-up Superman... I was approached for the very first time after '300' and asked if I wanted to do Superman. I was doing 'Watchmen' and I thought it was difficult to take a sidestep there — it's like the opposite in a weird way. But I am a fan of the character, and I felt more after 'Watchmen' like I was ready to make Superman because I felt like I had broken the rules, and I could fix it... I don't think [producer] Chris [Nolan] knows how to discuss or would want a non-personal movie. And I don't know how to make a movie that's not personal — it's impossible. And I don't think Chris would ask me to do it if I was going to do it that way." For instance, the scene where Krypton explodes — I don’t think it’s giving anything away, we all know that — the idea was huge, epic orchestral, because that’s what the images are, and I suddenly thought what if we go the other way. What if we stay focused on Mom. What is that? To save the world, to save your child, to give your child away, to send your child across the universe. What must you be feeling? I went for the smallest, just a single violin, middle e stradivarious, but that violin going for the epicness, we kept focusing in on the small, the personal. I try to just keep my eye on that, don’t ever let go of that, don’t ever let go of the characters. Quite honestly my way into this movie, having grown up with Superman and knowing that Kryptonite can kill him, I never thought about what else could kill him. I finally figured it out, it’s very simple: he has feelings. You can break his heart. That’s his vulnerability. He’s a decent man, or Kryptonian. This idea of wanting to be a part of the human race, that struggle that people have go through. So for Avengers 2, you have a draft done, you start shooting in early 2014. What will be the main conflict this time, now that they've formed a team? Trying to stay a team? Becoming their own worst enemy? Because these are not folks who can pull off making a movie out of a Shakespeare play in twelve days. No, they're not. And actually, that's the middle of the movie, them trying to. It's the Avengers trying to do Measure for Measure, and it doesn't go well. It's very exciting, especially in 3-D. [Laughs] The rest of it, you're right about — it was necessary to build this team, but what happens to them and to the world when they actually exist as a team? How does that work? And I have until we shoot in February to make sure that I'm right. The concept that I brought in to the movie was a concept of kind of wanting to explore Wolverine at this place where he's lost everything. The original saga is so much about his own mortality and moving on and love and how Wolverine can't love or connect with people because in a sense he outlives them all and so many of them die on his watch. He's lost so many people he cared about in the past. The Wolverine we find in this movie is a guy who has given up. If living is defined by our interactions and intimacy with other people, it's a Wolverine who has given up on that. That's a really great place to start with a character, and then on top of that it was instinct working on the script that it just seemed like an impediment to have him be invulnerable. If anything, I wanted this movie to be about what happens when a god is vulnerable; when an immortal becomes vulnerable. This is everything he's been wishing for, but is it what he wanted? Meaning you find a guy who almost would pay money to be able to get off this boat and can't, because his mortal coil is immortal, then suddenly circumstances in the story actually make him vulnerable. Now he has to deal with what he wished for. Here's an interview with Twilight actor Booboo Stewart, who plays Warpath in the movie. And here's an interview with Sarah Carter, who plays Maggie on the show.